Delta County Memorial Hospital and Stork's Landing recognizes that the birth of your baby is a special and personal moment in your life and we are privileged to support you through your pregnancy, labor, delivery and postpartum periods. In Stork's Landing, we provide a secure unit with a relaxing, home-like atmosphere and competent staff. We use central monitoring so you and your baby can stay in the same room throughout your entire stay. Stork's Landing has six spacious suites designed for safe management of labor and comfort for your family. We are a Baby-Friendly Designated birth facility (2017-2022), a global designation by the World Health Organization and United Nations Children's Fund (UNICEF) that recognizes the optimal level of care we provide for breastfeeding mothers and their babies. Please schedule an appointment to tour Stork's Landing and have your questions answered. We are excited to meet you! 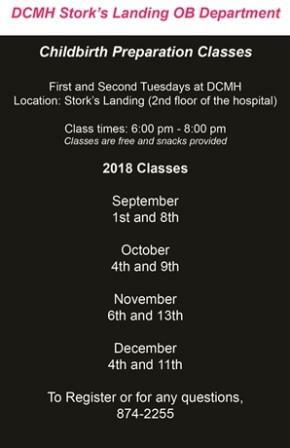 Before your bundle of joy arrives, we offer a free prenatal class in Delta the first and second Tuesday of each month the third and fourth Tuesday of each month. The class meets from 6 p.m. to 8 p.m. The class includes prenatal information, introduction to Baby-Friendly 10 Steps, breathing and relaxation techniques, what to expect during the different stages of labor, vaginal and cesarean birth, postpartum care and breastfeeding. At any time prior to your delivery date, two triage rooms available for you to be evaluated by our specialized nurses. Our highly trained nurses can perform tests and monitor you and your baby as indicated by your provider. Our rooms are designed for the LDRP model which stands for Labor, Delivery, Recovery, and Postpartum. This means you remain in the same spacious room throughout your stay. Central monitoring allows for our team to monitor your labor and the baby's heartbeat at the bedside or at the nurse's station. You have the reassurance that your nurses are constantly monitoring your progress while allowing privacy during this exciting time. Remote fetal monitoring allows for laboring mothers to walk and still be observed on the monitor. These can also be used while in the Jacuzzi tub. We believe in assisting you in the type of birth you desire. Jacuzzi tubs and showers in each suite can assist you with various methods of pain control and laboring techniques including the birthing ball, peanut ball, rocking chair, walking, squat bar, IV pain meds, and epidural anesthesia. Certified nurse anesthetists are available around the clock, every day of the week for epidural administration or other specialized needs. We provide excellent obstetrical care and take the risks associated with TOLAC very seriously. At Stork's Landing, we realize that a trial of labor after cesarean is often the preferred birth choice. For the safety of you and your baby, we have formulated a team to review each application for a trial of labor. Your physician will present your case to the team who will thoroughly review your medical history and course of pregnancy to determine whether or not we can safely plan for a Trial of Labor at our facility. If the team determines you are currently a candidate to plan for a Trial of Labor, the process continues throughout your pregnancy. Many risk factors do not present themselves until the end of a pregnancy or the beginning of labor. Your physician will keep you informed and complete a risk assessment when you present to deliver. In the event that you have a c-section, you are able to easily transition to our C-Section Suite/OR. Then, back into the same room you were admitted for recovery where you can be with your baby immediately. We encourage skin-to-skin contact immediately after delivery for at least an hour or until breastfeeding has been initiated. We recommend continuing this special contact throughout your stay and after going home. The benefits of skin-to-skin include: promotes breastfeeding, stabilizes baby's temperature, blood sugar, heart rate and breathing rate, and is a comfort and bonding experience for you and your baby. Several nurses on our staff are Certified Lactation Counselors (CLC) and International Board Certified Lactation Consultants (IBCLC) and offer support during your stay or after you have returned home. 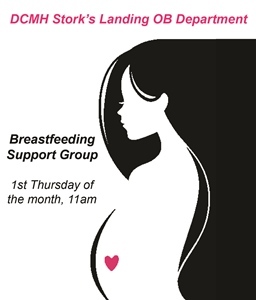 Assistance can be provided by phone call, one-on-one consultation or you can attend our monthly breastfeeding support group held the first Thursday of each month. We strongly support breastfeeding. At the same time, we respect your decisions about feeding your baby. We are committed to supporting YOUR goals and we ask for honest feedback on how we can best help you adjust to your changing family. One of our registered nurses will call you several days after discharge to follow-up with you. We want to check-in with you and see how your overall health is and answer any questions that you may have after going home. For inquiries please call Stork's Landing at 874-2255.